Science, technology, engineering and math (STEM) education and research professionals will come together with representatives from commerce for the eighth annual Collaborating for Education and Research Forum from 8:30 a.m. to 2:30 p.m. Saturday (Jan. 31) in the Jordan Hall of Science at the University of Notre Dame. The forum will focus on understanding, planning and implementing the best strategies in STEM teaching and learning. Matt Kloser, director of the Notre Dame Center for STEM Education, will share research findings behind best practices in STEM education. 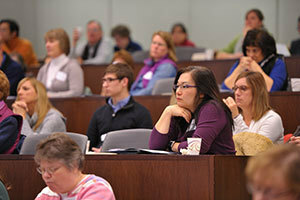 Attendees will be surrounded by opportunities to collaborate in STEM teaching and learning, including through the Notre Dame DNA Learning Center, ND LEEF, Project Lead the Way, Bowman Creek, the Michiana Science and Technology Center and other learning opportunities and professional development opportunities for STEM educators. The forum will include engaging presentations and active discussions. Representatives from Nanoscience Instruments Inc. will demonstrate the use of a desktop scanning electron microscope, which can serve to stimulate STEM excitement and improve academic performance in a classroom. In the Digital Visualization Theater in Jordan Hall, a Notre Dame physicist will show three-dimensional collisions from the Large Hadron Collider at CERN, the world’s largest and most powerful particle accelerator. An important, unique aspect of the forum will be the small group discussions, which will stimulate thought and action around collaborative opportunities rooted in best practices. The forum organizers will listen intently to participants discuss the types of programs they would like to see throughout the Michiana STEM teaching and learning community. Registration is free and includes breakfast, lunch and a certificate for six professional growth points for K-12 teachers and administrators. The forum is organized by the Notre Dame QuarkNet Center and sponsored by the University of Notre Dame College of Science in collaboration with the College of Engineering, the Center for STEM Education and the Office of Public Affairs. Originally published by Marissa Gebhard at news.nd.edu on January 26, 2015.